Posted on Wed, Jan 18, 2012 : 2:31 p.m.
Jennifer Dibbern, flanked by University of Michigan graduate students Jeremy Moore, Samantha Montgomery, speaks to reporters during a news conference Wednesday outside of Lurie Engineering Center. 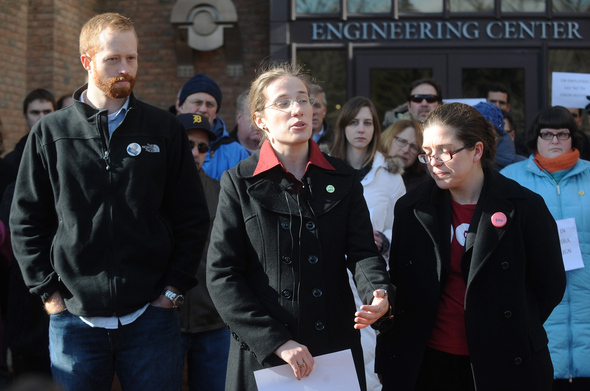 Recently dismissed University of Michigan graduate student research assistant Jennifer Dibbern says she was unfairly terminated from the College of Engineering because of her involvement in heated GSRA unionization efforts. A group of between 40 and 50 GSRAs said today at a noon news conference outside the Lurie Engineering Center that Dibbern's case, while extreme, is one of many recent instances of faculty discrimination against students who support unionization. "My career has been effectively ruined," Dibbern said. She lost her research job in the school's department of materials science and engineering in August and was dismissed from the school in December. She says she received positive reviews throughout her tenure as a doctoral student at the university until it became known that she was the treasurer for the Graduate Employees Organization, a group that is advocating for the unionization of student researchers. Dibbern has won multiple awards through the College of Engineering, including an outstanding student instructor award in 2011 and an award for recruiting in 2009. Dibbern says she won a research award over the summer. She was involved in U-M's central student government as a graduate student representative this fall. "She threatened to fire me if I didn't stop all outside activities," Dibbern said of her advising professor, engineering faculty Rachel Goldman who also serves on the faculty senate's Advisory Committee on University Affairs. Dibbern cited an email Goldman sent her on Aug. 8. "I realize you have other things going on but an increased in your focus on research is urgently needed," Goldman wrote. "This will probably require you to decrease your involvement in non-research." Supporters chant during a press conference for fired Michigan graduate student Jennifer Dibbern outside of Lurie Engineering Center on campus on Wednesday. University spokesman Rick Fitzgerald claims that Dibbern was dismissed solely for poor academic performance, which he says he is prohibited by law from commenting on. "This is an academic issue," he said. Fitzgerald said university administrators have made it clear that faculty are not permitted to intimidate students who are involved with the unionization effort. "The university has been very clear that it will not tolerate any discrimination regarding the unionization efforts," he said. U-M President Mary Sue Coleman spoke against GSRA unionization efforts last spring, but the school's Board of Regents voted to allow graduate researchers the right to unionize over the summer. Since then, that right has been hotly contested by individuals and organizations that say graduate student researchers should not be considered employees. The matter is currently before a judge who was appointed by the Michigan Employment Relations Commission to make the final decision about the legality of unionization. Hearings on the matter are scheduled for Feb. 1, 2 and 3. Due to the regents' vote in favor for the right to unionize, U-M's on-the-record stance is that the administration supports the right for GSRAs to vote on a union. However GSRAs say many administrators and faculty continue to be hostile toward the unionization effort. "I have not been personally affected but I can say for sure that many of my colleagues and friends have," said engineering GSRA Jeremy Moore. "What happened to Jennifer is not an isolated act of intimidation. ... This is widespread." Fitzgerald said that university administrators have not been able to thoroughly investigate claims of faculty intimidation because GEO has failed to provide adequate detail about alleged instances. GEO leader Samantha Montgomery, a graduate student instructor studying psychology and women's studies, said this summer the GEO approached university administrators with several instances of faculty engaging in intimidation tactics. When the university pressed for details, Montgomery said affected students did not want to identify themselves in fear of retaliation. "Given what's happened here, I'm glad we didn't identify them," she said. Fri, Jan 18, 2013 : 7:52 p.m. This professor's letter sounded reasonable to send to a senior graduate student who should be finishing up her PhD. This graduate student didn't sound like she was moving forward with her research and publishing papers. The professor is probably spending at least $100,000 in grant money per year to support this student when overhead, tuition, stipend, health benefits, and research costs are considered. Granting agencies want to see results for the money they give to professors. For the length of time this student has been a graduate student (~5 years), a lot of money has been invested in her. If she isn't publishing at this stage in her career, the professor has to question whether to continue giving her support. The truth probably is that the graduate student's activities were, in fact, affecting her research. By the fifth year, most PhD students are finishing up their research, publishing papers, writing their theses, and looking for jobs. I don't see how a serious student at this stage in her career would have the time to devote to organizing a union for graduate students. Thu, Jan 19, 2012 : 2:58 p.m. There are many hard lessons we must learn in life. One is that academic environments are often intensely political. Fiefdoms. Grudges. Insecure profs hiding their weaknesses. Professors stealing credit and work. Many would say the academic environments are worse than corporations in regard to vicious politics. One cannot properly have tenure and territory without terror. If for no other reason than to keep the underlings in line and doing the work. Fri, Jan 20, 2012 : 2:03 a.m.
Thu, Jan 19, 2012 : 2:11 p.m. Sorry, but I don't think people are thinking this trough logically. I am no Union fan, but likewise I am not fan of breaking the law or coercion. It's not possible to know what actually happened here, but there is certain action I would take were I Ms. Dibbern: 1. Formally waive the right to privacy on your student academic records via a lawyer. 2. Provide that waiver to the investigative reporting staff of several newspapers along with all records. 3. File a complaint with the NLRB. People are seriously naive if they think that institutions are not capable of - or have some right to act - outside the law. People have a legal right to attempt to organize unions. If you don't like it, change the law, but the law stands today. Likewise, corporations sometimes act in ways that bring on such organizing attempts by their behavior and frankly deserve what they get. I have been working most of my life and seen both good and badly behaved companies. Sometimes, one can simply leave a company but there comes a point when the behavior of that company demands some redress to protect the poor folks who don't have easy job mobility. I can hardly believe I wrote this and I suppose the local GOP will come by asking for my party resignation, but the older I get, the more I see moderation as a prudent course. I also have learned that people with power who can hide behind privilege and when there is money at stake, have a tendency to exhibit character deficiencies. Thu, Jan 19, 2012 : 4 p.m.
&quot;I also have learned that people with power who can hide behind privilege and when there is money at stake, have a tendency to exhibit character deficiencies.&quot; &quot;The quickest way to bring out the worst in people is to give them authority.&quot; - A. Lincoln I have seen that proven time and time again, character flaws manifest themselves clearly, and perceived brilliant minds are no exception - perhaps their egos exacerbate their flaws. Thu, Jan 19, 2012 : 10:10 a.m.
Thu, Jan 19, 2012 : 3:47 a.m.
Thu, Jan 19, 2012 : 1:07 a.m.
Jen is as smart and motivated as they come. I have a hard time believing that she was unable to perform academically and still have time for other campus activities! Keep your head up! Thu, Jan 19, 2012 : 12:05 a.m.
a2.com: After reading the email I was wondering if you could get Eric's take on this situation. Maybe he can offer some insight that the UofM cannot due to legal reasons. Just call him: &quot;An anonymous source with inside knowledge of the situation&quot;, Ms Dibbern: In the interest of full disclosure and transparency please publicize ALL performance related documents that you have received in the last two yours so those of us who have an open mind on this can develop an informed opinion. Thu, Jan 19, 2012 : 2:16 a.m.
She will never do this. The whole thing is part of the union's effort to organize. Why should they blow themselves out of the eater when they know the University can't comment? Wed, Jan 18, 2012 : 11:25 p.m.
Thu, Jan 19, 2012 : 12:42 p.m.
What annarbor.com did not report is that Dibbern was fired within weeks of getting that email. She's been trying to get the university to make amends without going public and burning bridges for months now. Thu, Jan 19, 2012 : 8:33 a.m.
@DonJ, Teaching awards are nice, but they don't speak to her individual academic performance. Thu, Jan 19, 2012 : 2:20 a.m.
DonJ All Ms. Dibbern has to do is demonstrate that she either refuted the performance assessment in the emails OR took the requested action to improve her performance and was dumped in spite of either course of action. She will, naturally, refuse to do this because her demonstration today is part of a union organizing activity and she needs to be seen as a victim. She knows the University cannot comment, so she is safe as long as she doesn't give anyone the real story of her performance academically or in her lab work assignment. She's just organizing for an illegal union (remember the ruling by the State). Wed, Jan 18, 2012 : 11:43 p.m. Yes, Professors are smart and don't tend self-incriminate in emails. What matters is the context: her performance was exemplary, as demonstrated by the awards she'd received, and previous emails sent to her by her professors. Then, suddenly her performance dropped off within a matter of weeks, conveniently at the same time the union situation was heating up. That's more than a bit fishy, don't you think? Wed, Jan 18, 2012 : 11:05 p.m. So many mean and derogatory comments here on this site it's not even funny. Wed, Jan 18, 2012 : 10:49 p.m.
To the people saying this young woman is &quot;at fault&quot; for ruining her own career: OF COURSE that is true. She has chosen to make a sacrifice so that others can have it better, and not just at this University. If we allow abuses in one workplace, what's stopping that from spreading? So please, stop stating the obvious, and start supporting this courageous young woman. Wed, Jan 18, 2012 : 9:53 p.m.
@brucea: &quot;real life and how a job works while you were at U of M.&quot; So, you're saying real life and a job involve allowing people to walk all over you? I feel bad for you. Wed, Jan 18, 2012 : 9:22 p.m. 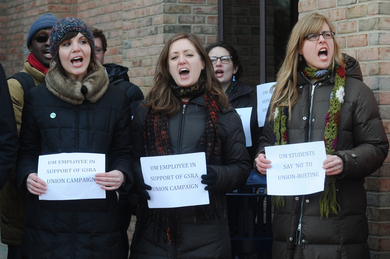 The actions of Professor Rachel Goldman and the University administrators are shameless. Nothing more and nothing less than a senseless attack on one of the few young, talented persons in this country that is not only successful professionally, but willing to work for something more than her immediate self-interest. And we wonder why we're in the state we 're in. I applaud the courage of Dibbern for going public (and subjecting herself to such pitiful ad hominem attacks) when the University would not rectify this injustice. We need more people like her in our workplaces and universities and communities. This Ann Arbor community member supports you! Thu, Jan 19, 2012 : 8:30 a.m. If she were &quot;successful professionally&quot;, I would think she would have earned her degree in less than six years. Do we need more courageous workers at the expense of talented people who complete tasks? Wed, Jan 18, 2012 : 9:04 p.m. It is clear that this outstanding researcher was fired for her union organizing. One of the reasons workers need unions is for protection against discrimination in the workplace. So glad to see that GEO is standing up for this woman! Also, I would like to add that I admire the courage of someone who fought for what she believed in at great personal risk, and who now is going public with her story. People across Michigan and the country are behind you! Sat, Jan 21, 2012 : 3:11 a.m.
Thu, Jan 19, 2012 : 8:26 a.m. I would not be so hasty to qualify her as an outstanding researcher. Six years working on a doctorate, that begs the question. Wed, Jan 18, 2012 : 8:50 p.m. I can see why the U doensn't want unions for their grad students. The first thing a union does is negotiate a contract. A contract is nothing more than an agreed upon understanding between labor and management. It outlines just what is expected of both. Without an agreement, it's very easy for management to take advantage of people by getting them to work more and more. Lack of a contract also makes it easy to dismiss workers if they don't totally become subserviant to the organization. In this case, it is highly likely that one's &quot;focus&quot; would be defined objectively rather than being a subjective decision by just one of the parties. Is Ms. Dibbern not supposed to have balance in her life? I might also ask some of the commenters here if she can't also seek legal redress without her character being impuned for being part of the &quot;entitlement&quot; crowd. A fair legal system is a way that a democracy ensures justice, which prevents many from seeking more violent measures. Wed, Jan 18, 2012 : 8:38 p.m. This is the tip of the iceberg in terms of abuse of graduate students by the College of Engineering. In one case, a student complained that his advisor was taking credit for his work by presenting it at national meetings as his own and applying for patents without crediting the student. The professor had him given a trespass warning in class one day and thrown out by the campus police. Later he spent 30 days in jail after he came to campus to see a Rackham conselor about filing a grievance. In another case, a black engineering graduate student was dismissed after he lead efforts by black graduate students to have grievances addressed. In another case, a student complained about not being put on patents for her work and was not only dismissed but deported. And the College of Engineering is not alone. There are many more cases around the University and it is very difficult to win in court because the courts have ruled that students do not have a property interest in their education the way an employee has a property interest in their job. Imagine that after paying more than $100,000 in tuition, you don't have a property interest. It won't get better until we have Regents who pay attention to their job and don't just like the country club atmosphere of being a Regent. Wed, Jan 18, 2012 : 9:28 p.m. Wed, Jan 18, 2012 : 8:35 p.m. Wed, Jan 18, 2012 : 8:33 p.m.
reading the email (which appears to be excerpted) this looks to be a standard letter documenting a continuing performance problem. The gist seems to be that the work hasn't been done satisfactorily, which was documented (this is surely not the only negative feedback that this student received) is why the employee wasn't continued on the research team. Knowing how UM grad programs work, the ACADEMIC dismissal is unrelated to the research project dismissal. The fact that BOTH occurred is a sign that the student was not living up to her responsibilities. If she had been successful in the classroom, she would have just found herself without funding for the term. The fact that both occurred, means there is more to the story that appropriately should not be aired out in the local &quot;paper&quot;. Regarding her teaching award and award for recruiting. Also speaking from experience, I can say that some of the best Graduate Student Instructors and student citizens sometimes have problems with their academic/research life. Teaching is something that can be immediately rewarding, where research is often isolating and difficult, without a lot of positive reinforcement. This student should learn the difference between correlation and causation. Wed, Jan 18, 2012 : 8:32 p.m.
@nekm1: I think she just found out how important she is. She's done at U of M, whatever union put her up to the organizing and promised her that things were going to be better has probably bailed out on her and after the little protest the rest of these students are going to figure out that if they don't want the same thing to happen to them they better put some distance between themselves and her. She's going to be setting at home wondering how it all went so wrong so fast. And now anywhere she goes and applies for a job they will Google her name and all of these articles will come up. Wed, Jan 18, 2012 : 9:18 p.m. Wed, Jan 18, 2012 : 8:25 p.m. Perfect situation for the &quot;entitlement&quot; crowd! Unionize the entire University including the students! That way, bad grades could go to arbitration, and everyone would be treated evenly and fairly. Why have GSRA's anyway? The thought here is that one Engineering student is more qualified than another? The fair thing would be to hire all students for the research work. What makes her any more important than the next person? Wed, Jan 18, 2012 : 9:40 p.m.
@ Rabin Wolverine - GSRA's are not teachers; those are the Graduate Student Instructors (GSI's) and they already make up the bulk of the Union. GSRA's are Graduate Student Research Assistant's who are brought onto a research team (normally funded by federal or industrial grants) and are paid for their active contribution to executing that research project. In most (but not all disciplines) the research that the student is working on (or the data that the student is working with) becomes the core of their doctoral dissertation. Here then lies the difficult core that is under dispute. On the one hand there is work to be done. The faculty member applied for a grant with the promise of having a finding by the end of a given period. The student is brought on the project to assist in getting that work done. On the other hand, this work is normally a hands-on internship/appreticeship - giving the student experience and data from which they create publications and/or their doctoral dissertation. Especially in the sciences, the GSRA work and the student's own work are tightly linked. Wed, Jan 18, 2012 : 9:16 p.m.
GSRA's are grad students who typcially help teach undergrad (and sometimes graduate) courses. It is part of their workload to help offset the cost of tuition their advisor pays for. If their advisor has a ton of grants, then the student typically will not have to teach. It isn't about who is a better engineering student, it is about funding. Wed, Jan 18, 2012 : 8:18 p.m.
She ruined her own career. These are the type of people you never hire.... they are ticking time bombs of entitlement and a lawsuit is always sure to follow. Thu, Jan 19, 2012 : 12:08 a.m. The greatest minds in the world would not allow philosophies better suited for a Chinese factory to reign supreme in a University. University's are supposed to be enlightened and progressive places, not places of abusive working conditions excused under the guise of being a &quot;right of passage,&quot; where professors can childishly punish their students for the sake of furthering a particular political agenda. I have to say, having heard from multiple sources about the conditions at UMich (particularly those conditions imposed by their relative abundance of emotionally-stunted professors), I am very glad I did not pursue a doctorate at this institution. Wed, Jan 18, 2012 : 11:39 p.m.
Boo hoo. A grad student gets her tuition paid for and gets to work with some of the greatest minds on earth and then squanders her opportunity. Yeah, working in a chinese factory is equivalent. Wed, Jan 18, 2012 : 11:01 p.m.
Chinese factory suits you best. Wed, Jan 18, 2012 : 10:16 p.m.
Hardly, Hardly, if you don't like your job quit.... If you like your job work with your boss to keep it... There will be a lawsuit, count on it and it will make her a pariah. It was her own doing. Wed, Jan 18, 2012 : 10:01 p.m.
Hardly. These are the ones who want fair and civil treatment for themselves and others, and are willing to risk their own lives and careers so you might live a better life. I'd hire this accomplished and intelligent woman in a heartbeat. Wed, Jan 18, 2012 : 8:16 p.m. So you had a grant to do research, you were told to drop the outside distractions and do your work, you choose to continue with the outside distractions and you got fired. It doesn't sound like you learned very much about real life and how a job works while you were at U of M.
Wed, Jan 18, 2012 : 11:02 p.m. Wed, Jan 18, 2012 : 10:28 p.m.
@braggslaw - that's the path of a coward, but I must agree with you. I don't know if I would be strong enough to do what she's doing. I might be too selfish. However, I'm glad she does it; she effectively fights for us all. People like her are part of what makes this country so great. Not all battlefields require guns, but they all require great courage. Wed, Jan 18, 2012 : 10:18 p.m.
she shows an extreme lack of judgement going public like this... Take your bruises, borrow money to finish your degree or transfer.. this type of activity will make employers avoid you. Wed, Jan 18, 2012 : 10:08 p.m.
@Rabid Wolverine - That may be; however, do you honestly believe it's a coincidence that, after years of hard work and dedication through which she won research and teaching awards, all of a sudden she's not putting forth enough, right as all this union stuff is going on? Wed, Jan 18, 2012 : 9:14 p.m.
Molle, Every advisor will require a different amount of time be put in to the lab. Most grad students know this and figure this out while doing their rotations. If she joined an advisor who required more hours be put in to her work than what she wanted to put in, that is on her. Wed, Jan 18, 2012 : 8:36 p.m. It may seem like Jennifer was distracted by her extra-curricular activities from the text of the article, but I know that she was spending long hours (sometimes staying in lab until midnight) up until her firing. It's not uncommon for GSRAs at Michigan to spend time on other activities (like sports or music) that is an equivalent time commitment to union involvement, and they are not asked to stop participating in those activities. Wed, Jan 18, 2012 : 8:14 p.m. I cant wait for her to gets a real job and sees how her boss talks to her, shes in for a rude awakening. Just wish I could be there. Thu, Jan 19, 2012 : 2:05 a.m.
Why is the term &quot;slave&quot; always used? She can quit any time she wants. She is not a slave, rather she should be grateful for he opportunity. Wed, Jan 18, 2012 : 11:04 p.m. In America (and in China, perhaps), employers only like slaves, according to you. Wed, Jan 18, 2012 : 8:13 p.m. I believe I remember being compelled to sign a form that I would not try to organize or participate in a union at my last job at UofM in 1979. I am not a fan of unions actually but would never support anything that would take away a person's right to become part of a union. Wed, Jan 18, 2012 : 8:07 p.m.
Social and economic justice for all!!!!!!!!!!! !